Residence #907 $1,130,000... Just Reduced! Deep in the heart of Fort Lauderdale’s trendy Las Olas beach district is a 29 story architectural masterpiece known as the Las Olas Beach Club. 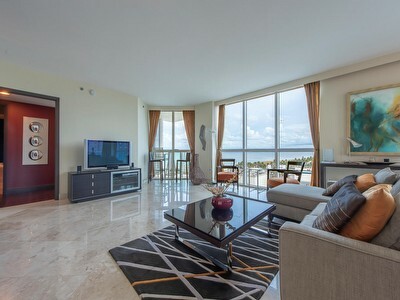 This Fort Lauderdale condo is considered to be one of the finest condominiums in the entire city and offers an inimitable fusion of glamour, excitement and stunning luxury. Built in 2007 by South Florida’s highly acclaimed The Related Group and with gorgeous interiors by the renowned interior design firm of Yabu-Pushelberg, the Las Olas Beach Club condo features the area’s stylish Art Deco design tinged with a uniquely contemporary flair dubbed Neo Deco. You’ll be able to choose from some of the most impressive and spacious residences in Fort Lauderdale starting at a more than generous 1,900 to 5700 square feet. With a location that’s second to none, amenities for every interest, and some of the most jaw dropping views, the Las Olas Beach Club Florida condo offers one of the best experiences in a city that’s famed for its contemporary lifestyle, world class beaches and diversity of culture. Experience the next level in high end condo living in this stunning Fort Lauderdale condominium overlooking the majestic seas of the Atlantic Ocean. We invite you to explore this informative website and see for yourself what an incredible condominium the Las Olas Beach Club truly is. Call or email us now for buying, selling, or leasing (minimum of 90 days) and have "the peace of mind" to know that you are dealing with true experts that have sold over $80,000,000 in resales since 2007 in this magnificant condominium!